The American Trends Panel (ATP), created by Pew Research Center, is a nationally representative panel of randomly selected U.S. adults. Panelists participate via self-administered web surveys. Panelists who do not have internet access at home are provided with a tablet and wireless internet connection. The panel is being managed by Ipsos. Stratum A consists of panelists who are non-internet users. They were sampled at a rate of 100%. Stratum B consists of panelists with a high school or less education. They were sampled at a rate of 57%. Stratum C consists of panelists that are Hispanic, not registered to vote, or non-volunteers. They were sampled at a rate of 28%. Stratum D consists of panelists that are black or 18-34 years old. They were sampled at a rate of 15%. Stratum E consists of the remaining panelists. They were sampled at a rate of 4%. Panelists were grouped into these strata in hierarchical order from A to E. For example, a panelist who is not registered to vote and has a high school education or less would be in Stratum B rather than in Stratum C.
The cumulative response rate accounting for nonresponse to the recruitment surveys and attrition is 5.3%. The margin of sampling error for the full sample of 2,524 respondents is plus or minus 2.5 percentage points. 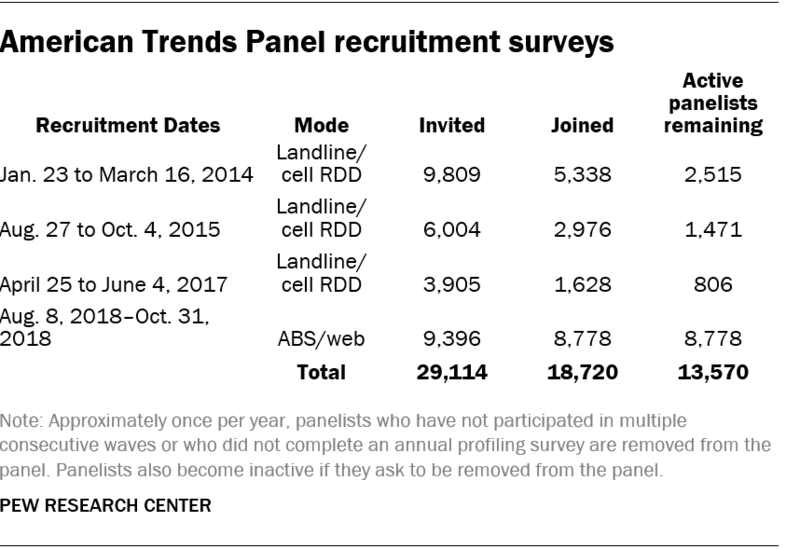 The ATP was created in 2014, with the first cohort of panelists invited to join the panel at the end of a large national landline and cellphone random-digit-dial survey that was conducted in both English and Spanish. Two additional recruitments were conducted using the same method in 2015 and 2017, respectively. Across these three surveys, a total of 19,718 adults were invited to join the ATP, and 9,942 of them agreed to participate. Of the 18,720 individuals who have ever joined the ATP, 13,570 remain active panelists and continue to receive survey invitations.